Our good friend Capt. Josh Roberts from Fish Southwest Florida Charters invited us out to try for some Redfish. The plan was to catch Pilchards and Threadfins and then work the mangroves throughout the bay. Unfortunately, bait took a little longer to get then planned as most of the bait around the pilings were glass minnows and tiny Greenbacks. We had to change our game plan slightly and run to a different bait spot than normal. This put us a few miles further then where we wanted to fish, but luckily we got the bait. We ended up with nice sized Threads, Pins, and Pilchards. The hook of choice were Gamakatsu 1/0 Circles. These are strong enough for reels with decent drag, but still are small enough to not effect the bait swimming freely. We all were using about 3 feet of 30LB Bullbuster Fluorocarbon. Depending on the wind and depth of water throughout the day, we were adding small split shots about 12" from the hook to help cast the bait and get it where we want it in the water column. We also were mostly nose-hooking the baits, but belly hooking them also works really well near the mangroves. After dodging the rain for about 2 hours, we finally were able to get to our spot where we thought we were going to have our best luck at a Redfish. On our way there, we caught countless 20"-24" Snook, a handful of Trout, and some Snapper. By using the trolling motor to stay a decent way away from the mangroves, we were able to get our first Redfish into the boat. It was in slot, and definitely was going into the cooler! Soon after our first one, we saw a school of Redfish swim past the boat. We started to head the way they were going, and within a few casts Capt. 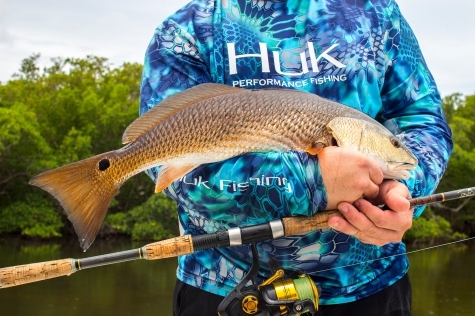 Josh was able to get this nice Red out of the water for a photo. It also went into the cooler, and will make for a great filet!